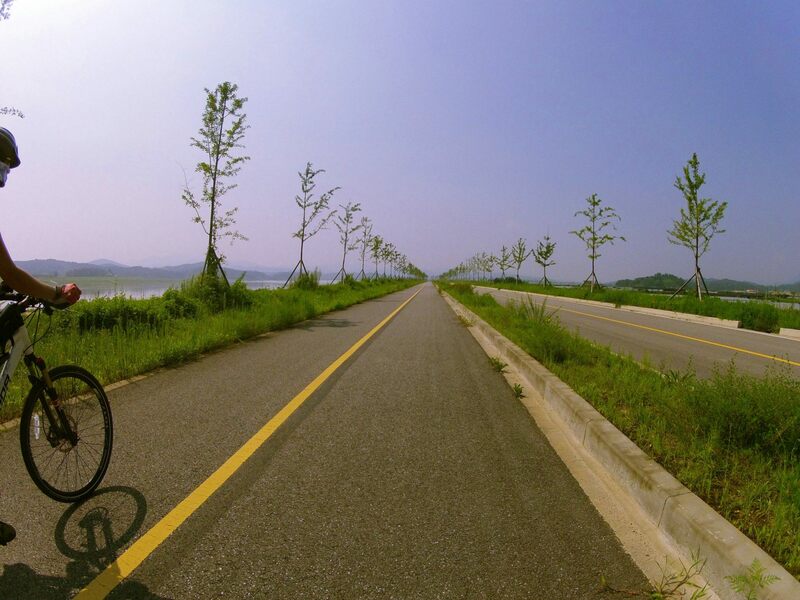 After having recently described your easy way across Korea on a bicycle, namely from the Incheon Airport to Busan, here’s a few more routes you may want to consider after completing the Incheon-Busan ride. These rides are off the beaten track, umm, bike path. I find them way more interesting than riding on dedicated, straight, flat bike paths all the time but yes, there may be climbs, wider roads and whatnot. 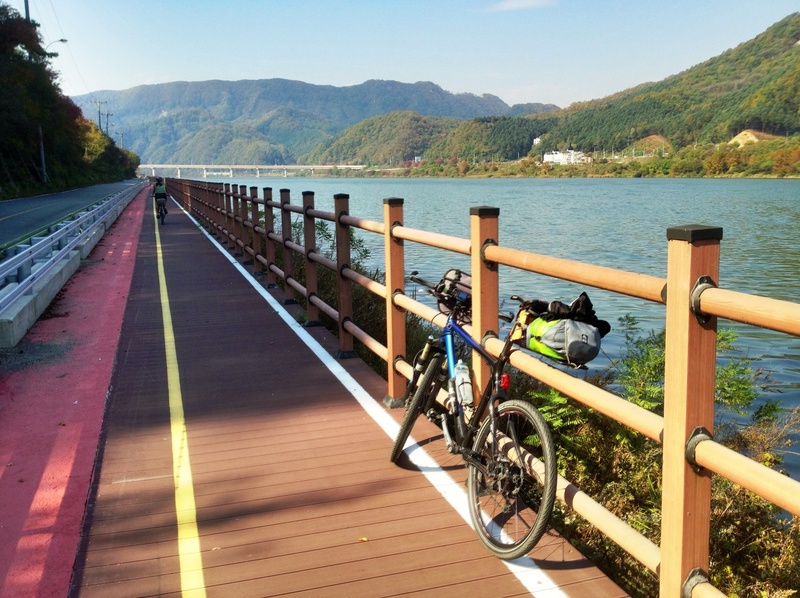 The routes do avoid busy roads and ugly climbs most of the time though, so yes, you can do them if you managed Seoul-Busan on the bike path. This route may well be my favourite. It’s relatively flat and provides quite a variety of sights. The landscape as well as the civilization changes along the way. Starting in the cooler north, heading further south where the climate gets warmer and with it the houses change, down to the south with its industrial cities and related wealth. 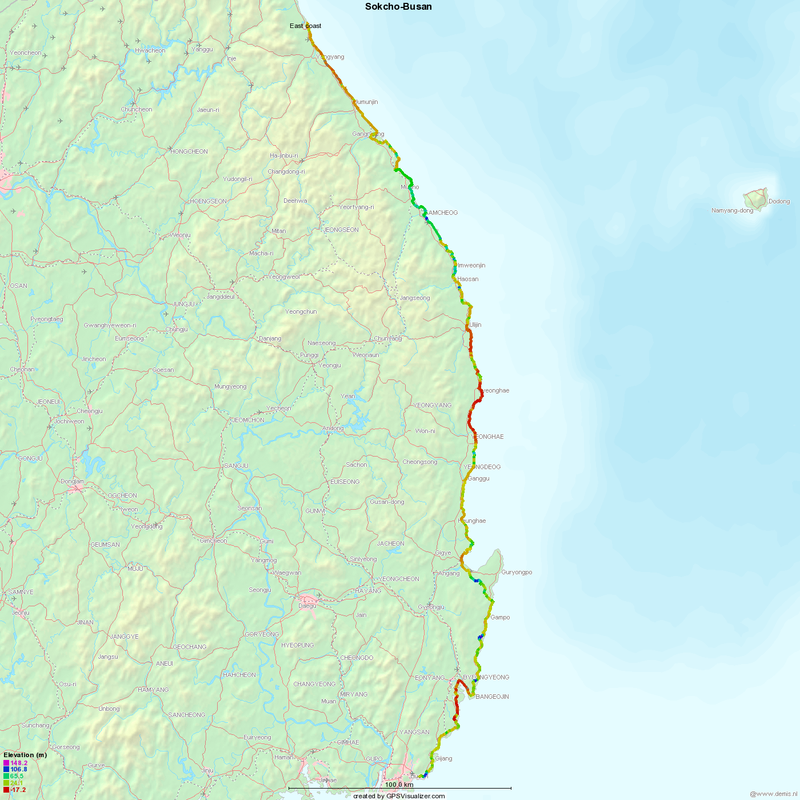 The Korean government is planning to build a bike path along the coast, I’d therefore recommend to do this route as soon as possible before the herds of cyclists come over — here’s the GPX file of the route on road. One option could be to ride it in 5 days as I did, but since there’s quite some population along the whole coast, you’ll certainly find accommodation in other areas as well. This last suggestion is really a no-brainer. Some 230km around the island, all flat. By spring 2014 the bike path is supposed to be completed, but even before that there is already a bike path along road 1132 which island. The island is speckled with motels, pensions and hotels, so you can spend the night at any place you like. Camp sites are also avail, btw, in case you want to use the opportunity of a flat terrain and haul your camping gear along. Getting to Jeju (from Seoul) is fairly simple as well. There are all the flights plus, my favorite, there’s an over-night car ferry from Incheon airport. 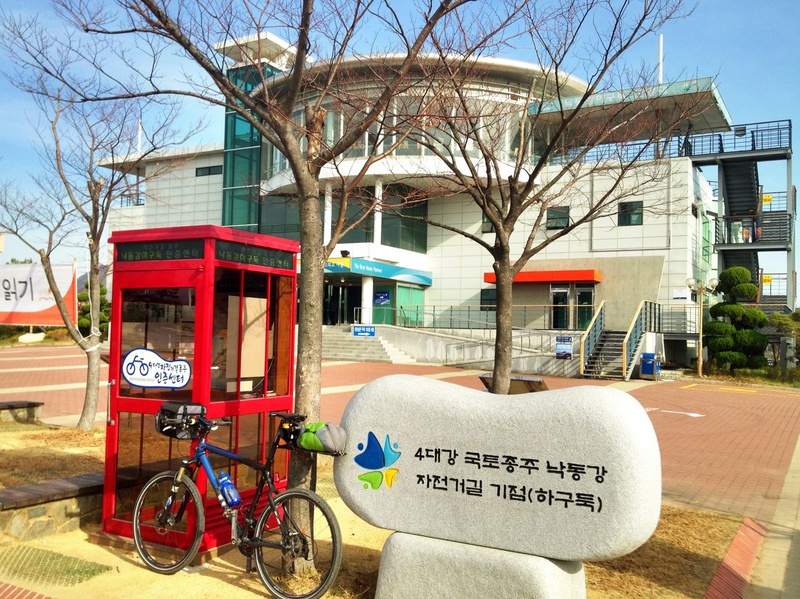 Push your bike onto the ferry at 8pm, eat, drink and sleep on the boat and arrive in Jeju around 7am, ready to ride. Same routine on the way back — especially convenient if you have all your camping gear with you. No GPX file for you to follow (since it’s really dead-simple), just one advise: Do the ride counter-clockwise, Ie keep the sea at your right shoulder. Doing it this way, you will have the wind in your back more frequently plus you will be on the correct side of the road to see more of the beaches (there won’t however be many cars on the road to begin with…). 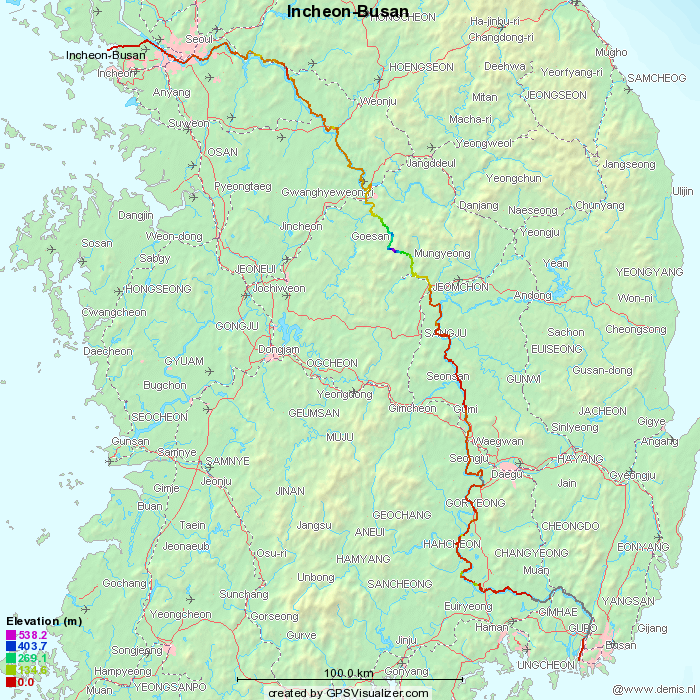 Quite a few people asked me about tips re bicycle touring in South Korea, particularly the trip Seoul-Busan — some 600km on a bike path. It seems a challenge at first, given that English is not very abundant in this country. But with a few tips it’s actually, even if you don’t speak Korean, quite easy to survive the tour. And have an enjoyable time. First, to the path. As said it’s all bike path (either dedicated or shared with very-low traffic road), you won’t get run over by cars. Go and download the .gpx file of the whole path (right-click; “Save as…”). Then go to either Maplorer or to Gpsvisualizer and upload the file there. This will answer your questions as to climbs — there are, with the exception of the one south of Chungchu (some 400m climb), none that climb more than 50-70m at most. The path is mostly along rivers and, since water tends not to enjoy climbing hills, mostly pretty flat. Once you’re out riding, finding the way is actually quite easy. For one, the bike path is well indicated with signs. Beyond, I do recommend you bring a smartphone with data connection along. You will have 3G network coverage everywhere you go. And with the right apps (both Android and Apple), your life becomes way more simple. Do note that Google maps is not that helpful in Korea. For finding your way around, install the Naver Maps app on your phone (or go to the Naver Maps website if you are at a PC). As of writing this, when you start the app you will see an “eye” icon in the upper right. Tap it and then tap the 2nd check mark from the right (that reads 자전거. If you’re on a PC, instead check the 3rd rectangular button at the top right, labelled the same…). You now see all the Korean bike paths overlaid on the map. Red are dedicated bike paths, blue are shared sidewalks. Ignore purple, it’s an ugly hard shoulder on a very ugly 4-lane road… Whenever you’re looking for the way while out on the path, fire up Naver Maps and there you go, it will show your current location. Of course, again, navigating the paths without a smartphone is no magic either, technology just made it a bit more convenient. If you’re coming in from overseas and are shying away from international data roaming on your phone, no worries. While, unlike the tiny rest of the whole other world out there, you can not easily buy a prepaid SIM card in Korea, you can actually rent a smartphone at the airport for pretty cheap. The booths are located in the arrival hall, they offer the latest Samsung&LG Android phones plus IPhones (if you’re lucky…). Rates and models are changing almost daily, so I’m not even getting into telling you what model costs how much; go check it yourself. Note that in lots and lots of places (as in every convenience store, at every bus stop, in most restaurants) you will have Wifi, so you won’t need too much cellular data, actually. Now that you’re rolling, finding necessities and places to sleep will be the next task. Let me tell you first that I do not speak Korean. I know a few food items (such as Bulgogi, Kimchi and whatnot), but that is about all the linguistic skills I’ve got. Yet I found it very easy to get around, so you shouldn’t have no worries either 🙂 If you live in the country, may I strongly suggest you learn the Korean alphabet? Yes, it’s actually an alphabet with some 20-odd characters. Just like the alphabet you read right now. Turns out that you can master it in a day or two and, trust me on this, it’s time well spent. Example: 모 are 2 characters from top to bottom, resembling M and O. 텔 are 3 from left to right, then down: They resemble the roman T, E and L. Now when you ride and see a signboard 모텔 — guess what you just found? Many words are actually English, just written in the Korean alphabet. Spend 2 days and learn it! Only Naver shows you the bike paths. Daum is useless there. Note that none of them provide breakfast. More on that later. You may wonder why I’ve put “Paris Baguette” to the list. This large Korean bakery chain scouted the whole country and opened shops in every decent settlement. Meaning as long as you find a Paris Baguette in a village, you can be sure that there is a bunch of motels, restaurants, supermarkets and whatnot around. For my touring, I usually stayed the nights in villages with a Paris Baguette. Which coincidentally also provided breakfast on most days. Which touches the topic of food. Note that neither Motels, Pensions nor Homestays usually provide breakfast. Motels (aka love motels, but they do make for a good night’s sleep for a tired rider) are really only a single room. They run some 40-60k Won per room per night. Usually they have a shed where you can safely store your bike or they typically (especially outside cities) allow or even “force” you to bring your bike upstairs into the room or the staircase. 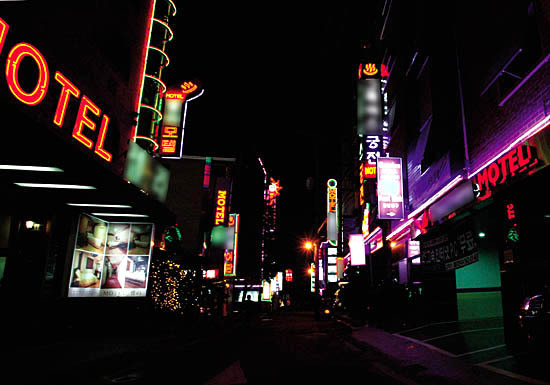 In any case, bring a light wire lock and you’ll be more than safe; theft rate in Korea, especially outside large cities, is close to zero. Homestays are, as the name says, usually just single rooms in the owner’s house. Haven’t tried them often enough to really give advise. Last in the list are pensions. They are typically multi-room floors or detached houses with a kitchen. Price depends on size (and number of occupants). I have yet to find one below 80k Won (for some 4 people). For the price-sensitive, there’s btw. also the option of sleeping in a Jimjilbang. This is a sauna which provides a resting area where people doze off for a few hours. These saunas are very common across Korea, many Koreans use them overnight (at a cost of some 10k Won a person). Back to food, what I typically did when touring was having a light lunch somewhere in a small restaurant or more often than not in a convenience store. They sell both instant food (Korean and Western) as well as boxed lunch sets. They all have microwaves to heat your food and some tables and chairs. You see, besides some water and a change of clothes, there isn’t really much you need to bring. As to clothes, btw. All motels have a fan (on top of aircon). If you wash your bike clothes in the evening and hang them in front of the fan, they’ll be dry within 3-4 hours. Don’t pack too much stuff, a 2nd set of clothes for the evening is all you need. Motels also provide toiletries. And in the worst case, just buy amenities at the next convenience store. Which raises a topic for foreign visitors: While most places accept credit cards, they usually only accept cards issued by a local bank! So your overseas card will likely get rejected. Motels, pensions and the like usually only accept cash anyhow. ATMs with global connections can be found at every bank though, so with your Cirrus, Maestro or other global ATM card you’re safe. you’re lucky — full-sized bikes have been spotted on the KTX. But people with bikes have also been rejected, be warned! Finally, to move within the greater Seoul area including Incheon and the airport, there’s the subway system. You are officially allowed to bring your bike on the subway (you guessed it, for free) on weekends. You’re supposed to use the first or last car though. On weekdays, most lines ban bikes however this is not strictly enforced outside rush hours. Enforcement isn’t actually necessary even during rush hours since there’s no way for you to haul a bike onto a platform or into a train any given weekday between 7:00-9:00 and again 18:00-19:30 anyway. Even the toughest of bikes would be stomped to pieces within seconds ;-). So yes, you can move around during low-traffic hours. Just remain polite, please. That’s it now, really. If anything is still unclear or if you have an idea for improving this guide, please shout out in the comments below! PS: A couple of months after me writing this, you may have done the ride and feel like upping it a bit. Then here’s a few more rides “around the block” for you to consider. Bringing a bike is free.